Spiders and insects are often lumped together, but there are some significant differences that even young children can begin to recognize. Noting the difference between insects and spiders isn’t just important for discerning between the two “in the wild”, but the act of comparing and classifying is perfect for practicing logic, reasoning, and science skills. This three-part activity may take a lot of words to describe here in the blogosphere, but it’s really quite simple, very effective, and loads of fun! Point out that insects have three body parts (head, thorax, abdomen). Create three balls with the playdough and connect them together, looking a bit like an ant. Explain that sometimes these body parts are similar sizes, but sometimes they look differently. For a beetle, the thorax is smaller and the abdomen is longer and wider (manipulate playdough accordingly). Or you may have a very long and skinny abdomen like a dragonfly. But every insect has three body parts (go back to three fairly equal balls like an ant). Another characteristic of all insects is six legs. Insert the six pipe cleaner segments as you count them out. Lastly, most insects have a set of antennae for smelling or feeling (insert another set of pipe cleaners or toothpicks). Add that many insects also have wings and discuss a few examples. Now you have a lovely ant-like sculpture. Set that one down and let’s get to the spider! For your spider discussion, follow in a similar way, narrating and building as you go, showing how the parts may differ for different types of spiders (big round abdomen or long skinny abdomen, etc.). A spider will have two body parts (the cephalothorax, or head, and an abdomen), eight legs, and usually eight eyes (I create the eyes by pricking the dough with a toothpick, leaving eight holes). Spiders will not have antennae or wings. You may want to include other spider facts you can find here. Now that you’ve discussed the difference between the two, map it out on a Venn diagram. These diagrams are great for sorting information with young children. A Venn diagram teaches sorting and classifying in a very visual way. (If you need a quick refresher on Venn diagrams, click here and scroll down to “Example”.) Children are usually very quick to catch on to this logical, graphic organizer. 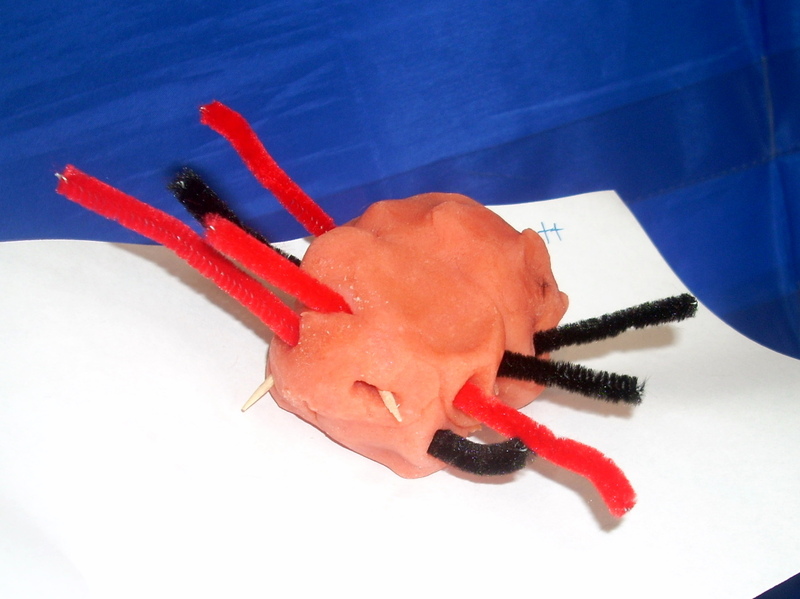 As the culminating activity, have the children create their own insects or spiders. Each child gets a lump of playdough and access to toothpicks, pipe cleaner segments, and tissue paper or wax paper (for wings). Explain that they might want to create something they’ve seen before, like an ant, or a black widow spider, or a butterfly; or they might want to create a new kind of insect or spider that we’ve never even heard of! As they create, talk to them about what they’re making, incorporating some of the information you’ve presented (“Oh, I see you have 8 legs on your creature! Does that mean it’s a spider?”), but keep in mind that these are their own personal creations. Assess the children by talking with them, not just by looking at what they’ve made. Some children will create a picture perfect spider with two body parts, eight legs, eight eyes, and a set of chelicera to boot! With that child you may simply point out those attributes and ask if it is indeed a spider. Another child may have a creature with eight legs, a set of wings, and three body parts. With that child, you may point out that this is a very unique creature! It has both insect parts and spider parts! Then ask the child to point out which is which along with you. Now you’ve not only gone over specific scientific information, practiced some counting, sorting and categorizing, and done some finger-strengthening creating, but your lucky children each have an insect, or spider (or spider-insect) to take home as a lovely pet! Hi, I find your activities for preschoolers very creative, resourceful and fun! Today I had a little talk with my 8 years old who insisted he needed to take a spider into a glass jar to school for science class. We are a vegeterian family and care about life in every single form, so I had to write a note to the teacher, explaining why he won´t do homework in the way she requested. Now, I wonder how I could build an adecuate insect-watch-device (no idea what´s the right name for it in English). Do you have any suggestions? Thanks for sharing so many activities and for supporting integral learning for young children. Found your post when I was looking up info on spiders and insects. You have such a cute way to teach kids. I love the picture of the playdough spider . Too cute for words! Great post Amanda. I used to get a magazine called Wondertime when my girls were toddlers. I always saved the last page which explained some scientific topic in a way for young children. I absolutely love this post. It reminds me of that series. I was really disappointed when the magazine folded. Glad to have bloggers like you out there helping moms like me! Just found your website and loved the difference between insects and spiders. Thank you for a fun, informative, and easy lesson. I know it was developed for preschoolers, but I will be using it with a group of 1st graders. Perfect! Thanks so much for sharing this.